Excerpts from Reviews for “The Chemistry of Gold Extraction”, 2nd edition, Society for Mining, Metallurgy & Exploration Inc., Littleton, Colorado. 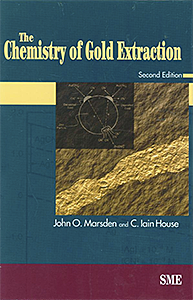 “The authors of The Chemistry of Gold Extraction have covered the gamut of this subject, from ore classification and mineralogy to process selection and effluent treatment…….An excellent feature of the first edition was the chapter on industrial applications, and this has been substantially revised to provide (information on) more plants, technologies, and improved flowsheets and process descriptions. This book has justifiably become established as the leading reference on gold processing, and the updated edition firmly consolidates this position. In one volume the reader can find both solid theory and practical applied data – in all cases excellently presented and illustrated. As with all good textbooks, not only the knowledge and experience of the authors, but their affection for their subject, is manifest. All those who refer to this text, be they students, researchers, operators or hard-bitten consultants, will enjoy the read, while learning much more about this fascinating subject” in Materials World, Institute of Mining and Metallurgy, London, UK, by Michael Anthony, December 2007. “…..The new edition is much more than a reprinting…..Authors Marsden and House share a descriptive style, and enthusiasm, that will entice one deeper into a history of ingenuity and motivation that began early in man’s past. Other authors may encourage their readers to visit a library and find out more, but few manage to distill so much information into a single volume……Giving a second copy to a friend maybe the only way to ensure that one volume remains on your bookcase.” Peter Broad, Wardrop Mining & Minerals Division. “….The present edition is an extensively revised and comprehensively updated version…….This is an excellent work that is highly recommended to hydrometallurgists, to students, and engineers. The authors are to be congratulated for their fine work.” Prof. Fathi Habashi, Laval University, Quebec, Canada, December, 2006. “This new edition, and its format of emphasizing the chemistry of every type of gold ore treatment, is superb, and the result is literally a gold mine of information. For the gold metallurgist, reading this volume will be like reading a novel that can’t be put down. It is certain to become a standard reference for many years to come.” Robert S. Shoemaker, March, 2006. “Pure gold in and of itself. This book is an amazingly detailed exposition of gold concentration and extraction. Many books are long on the theory and very thin on the engineering issues involved. Other books are enhanced process diagrams and cookbooks and give very little theory…….a comprehensive view of the entire processing from geology to gold bar is a real treat.” Alan Burnes, December 2008. Excerpts from Reviews for “The Chemistry of Gold Extraction”, 1st edition, Ellis Horwood, Chichester, England. “……“A gold mine of information and a remarkable piece of work” states Robert S. Shoemaker in the forward. Perhaps an equally good description would be “The gold metallurgist’s Taggart”……” Engineering & Mining Journal, September 1993. “In the foreword, Robert S. Shoemaker comments that the volume contains “literally a gold mine of information and a remarkable piece of work”. The reader is unlikely to be disappointed. A number of books describing the extraction and processing of gold are available; however, this new book embodies several important and distinctive features. Notably, it is an up-to-date record of the technological developments in gold extraction with an emphasis on demonstrating how the mineralogy of the ore affects the choice of processing route and the consequences for plant design and operation………. In summary the book fills an important gap in gold processing technology by linking the fundamental principles of mineralogy and chemistry with sound and modern plant practices. It reflects the authors’ passion and experience of the subject area and will certainly have a wide readership in industry and universities.” Minerals Engineering, April 1992, by Richard A. Williams, University of Manchester, Institute of Science & Technology. “….the book emphasizes the practical applications of gold extraction chemistry while placing importance in its theory…” Mining Engineering, July 1992. “…..it is difficult to pick up (the book), open a few pages and not get quite ecstatic…..Our industry needs the clear process understanding your document offers….” John Goode, Kilborn, November 1992.